Posted March 29, 2009 in Genre, War. 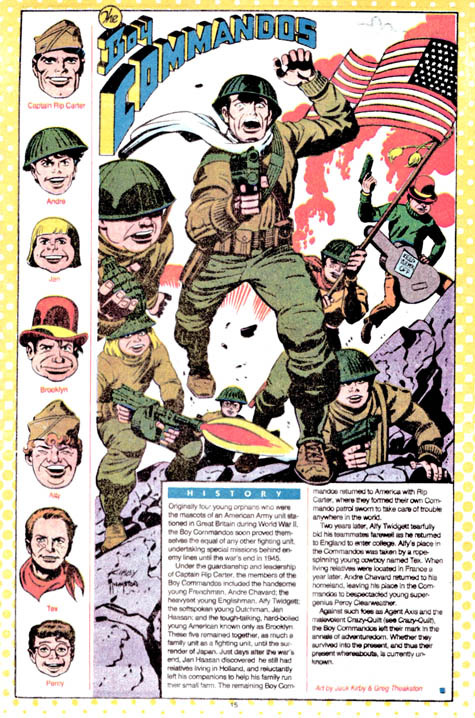 This was the fourth of Kirby’s twelve issues of the series featuring the team of DC’s WWII characters who couldn’t support their separate features, The Losers. In this 18-page story, “Bushido”, he moves the action to the war against the Japanese in the Pacific islands (those Losers get around), as they infiltrate a Japanese base and capture a Colonel, leading to a chase through the jungles and quite a lot of action in very few pages, including escapes, booby-traps, prisoner exchanges and single combat until the Losers finally complete their mission. Kirby’s stories of the war in the Pacific tend to be a bit more fanciful than those set in Europe, presumably because his first-hand experience was in Europe and for the other stories he has to rely on second-hand accounts. Still, there’s a lot of neat stuff, including a well-designed two-page splash with some carefully labeled heavy guns. D. Bruce Berry inks the whole thing, with somewhat uneven results. A few pages, including the splash, look really good, while others look rushed. In addition to the story, there’s also a 2-page “Wheels ‘n Tracks” feature, looking at some of the armoured cars of the war, from the Germans, Italians and the British. The cover is also by Kirby and Berry. Posted May 21, 2007 in Genre, War. Posted May 1, 2007 in Genre, War. Very attractive Kirby/Stone cover for this issue, really getting the concept of defeat across. Also, very nice job on the colouring, which gets the heat and dryness of the scene across. Posted April 7, 2007 in Genre, War. This issue has a reprint of SGT. 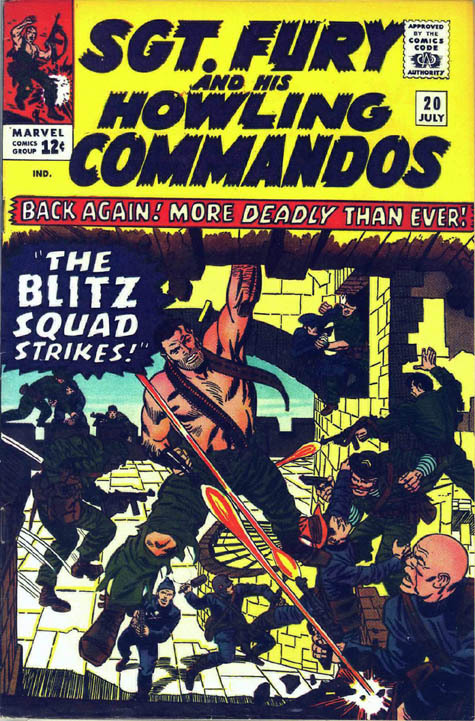 FURY #18 , including the Kirby/Stone cover with Fury in action surrounded by headshots of the other characters. 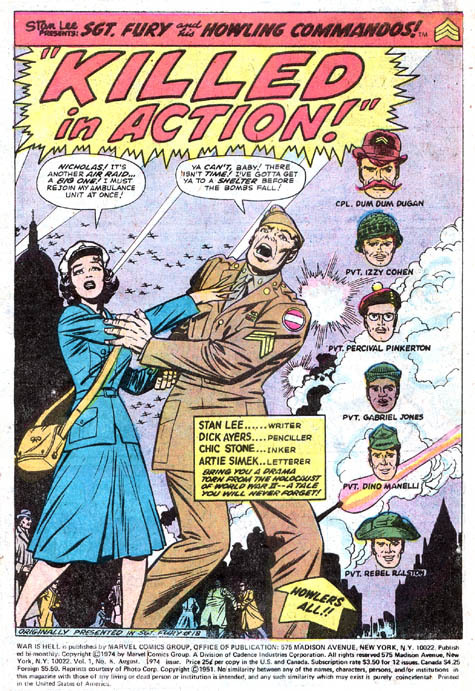 Not sure exactly how it came about, but Kirby also pencilled (uncredited) the first and last page of the story “Killed in Action”, with the last page having an emotional scene of Fury finding out, after he spends the issue planning to propose to her, that his girlfriend Pamela Hawley died during an air raid. They’re both really good pages, but looking at the rest of the book I’d have to say that Ayers and Stone had the look that Kirby had established for the book in his issues down cold, so I’m not sure why Kirby would be brought in for two pages. Has the story behind that ever come out? Were these pages done as substitutes for pages already drawn, maybe with the decision to kill the character coming later? Posted March 13, 2007 in Genre, Kid Gang, Superhero, War. Two Kirby drawn entries in this issue of DC’s character index series, both inked by Greg Theakston. First up is Willie Walker in his largely unexplained guise as the spirit of death among the New Gods, the Black Racer. Pretty good collage of images, although, yeah, that cosmic skier thing still looks weird. Going back a generation we get the Boy Commandos and their adult sidekick Rip Carter, with a wartime action pose and headshots of all the members, including the lesser known post-war replacements Tex and Percy (oddly appearing in the war scene, as if they helped liberate us from the axis powers). Posted December 24, 2006 in Genre, War. There’s some disagreement over whether Kirby had a hand in this particular Harvey Comics cover. I tend to go in favour, but not strongly, mostly based on the face of the main figure pointed towards us. That seems to have enough Kirby touches, but the overall piece doesn’t have anything definitive, which could just be the inking. Whoever was involved, it’s a really strong cover, with some nice bold colouring. Posted August 16, 2006 in Genre, War. 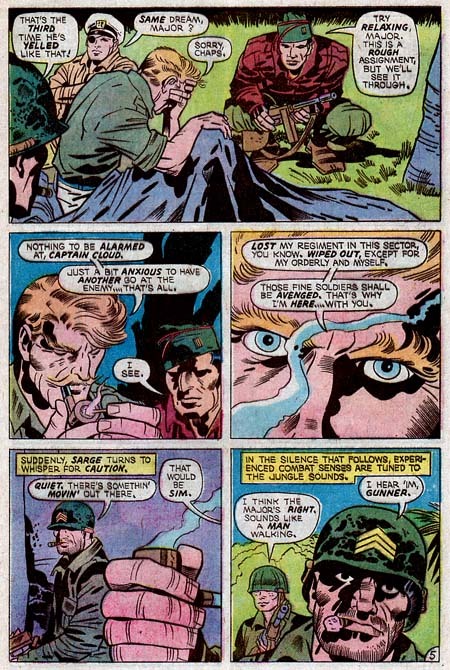 The last of Kirby’s dozen issues of OUR FIGHTING FORCES sees the Losers stationed in occupied France, trying to get some information on German troop movements. Gunner has taken the oppurtunity to train four young orphaned French boys how to be marines, sort of playing Rip Carter to their Boy Commandos. While impressed with the boys’ skills, Cloud and Storm order them out of the village just as a German attack starts. While the other Losers are pinned back from the fighting in the village, Gunner and the boys keep advancing bit by bit until they get the German attack to break off. 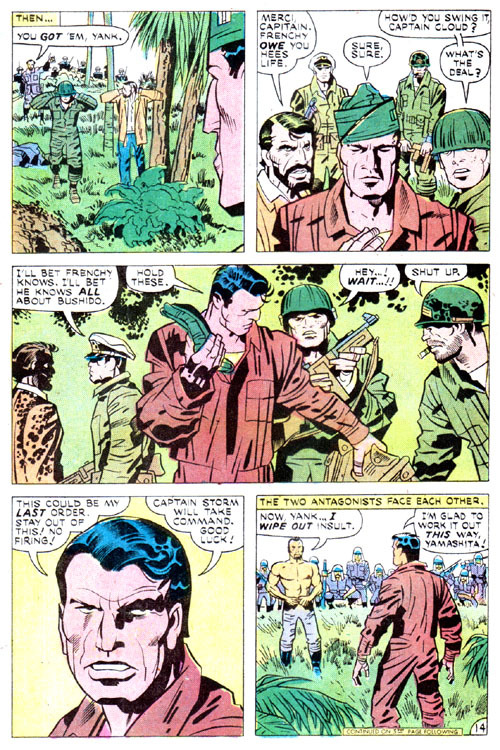 The issue ends with the Losers driving off into the distance, saying they’ve “stayed here too long”, which is hard not to read as Kirby’s own statement, given that this was the last of the books he wrote in his 5-year stint at DC (a few other books came out later, mostly stuff he just drew or which were heavily modified). A nice little slice of wartime story. If anyone ever does a Boy Commandos revival they should do a story where they meet these four French kids. D. Bruce Berry inks the 18-page story. Posted May 10, 2006 in Genre, War. 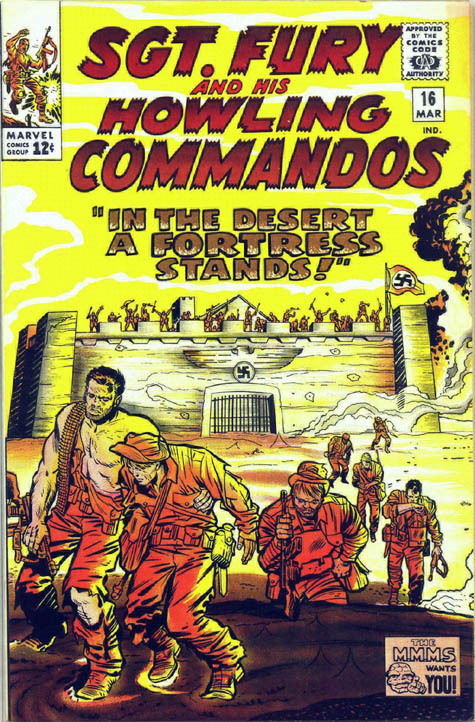 Despite a generic Joe Kubert cover showing the Losers wandering into a German trap, this is another Kirby issue of OFF and set in Burma, where the Losers team with a British officer, Major Soames, to set up an observation post in an area where the Major previously lost his whole regiment. Ever since, the Major is plagued by vivid dreams involving demons, bottomless pits and multi-armed creatures. The Losers manage to fulfil their mission among the ruins of a temple, but the Major finds his dream coming to life. Soon there is silence, the “Half-Sleep” of tired men… whose senses listen while their bodies regenerate for renewed action. 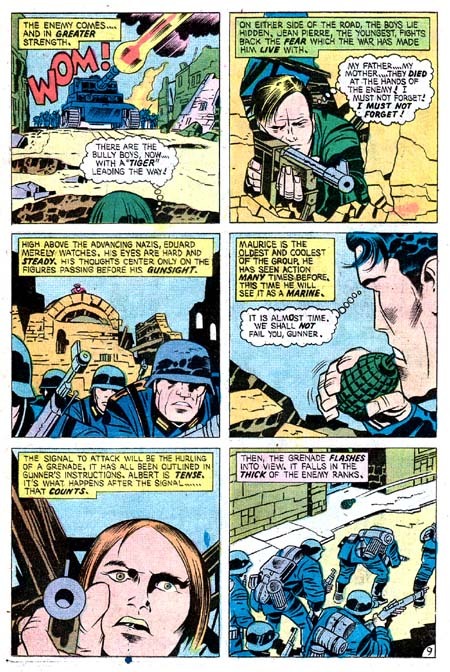 A nice description no doubt based on Kirby’s own experiences in WWII. Posted February 26, 2006 in Genre, Superhero, War. 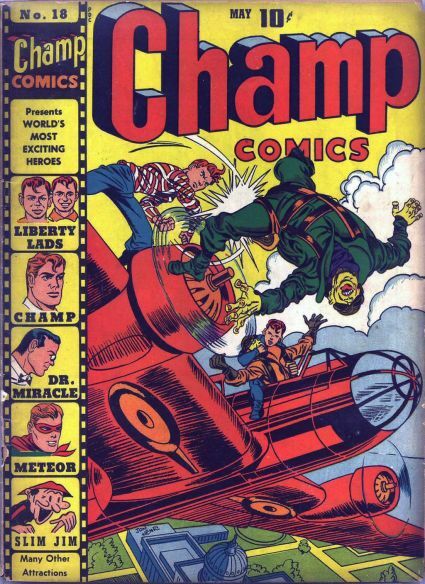 CHAMP COMICS #18, 1942. Another wartime cover for Harvey, this one signed with the “Jon Henri” pen-name. Don’t try to think too much about how exactly the Liberty Lads got the jump on those Japanese pilots in mid-flight, much less how the Japanese pilots could attack Washington DC. Posted February 21, 2006 in Genre, Kid Gang, War. 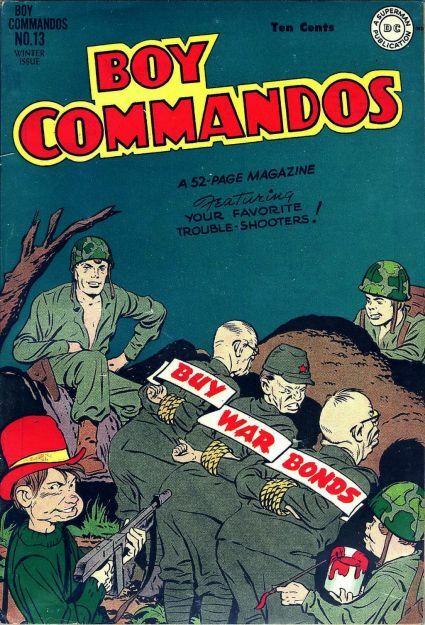 BOY COMMANDOS #13 – 1945. 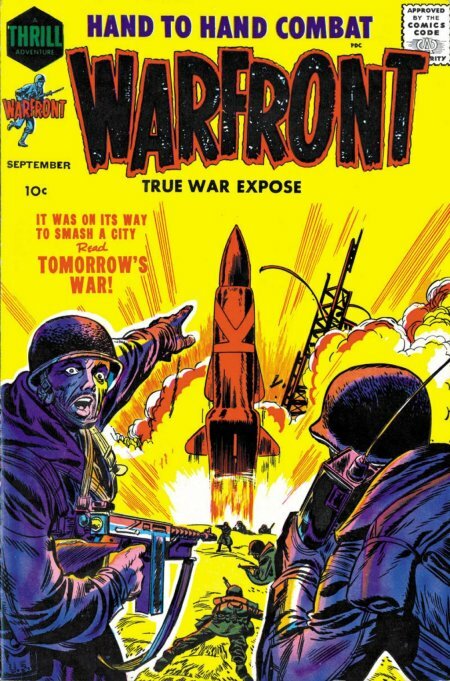 Nothing like some patriotic propaganda late in the war, actually the final war-themed cover for the series. Of course, the boys would be coming home for stateside adventures soon, and had already lost one member for this cover.